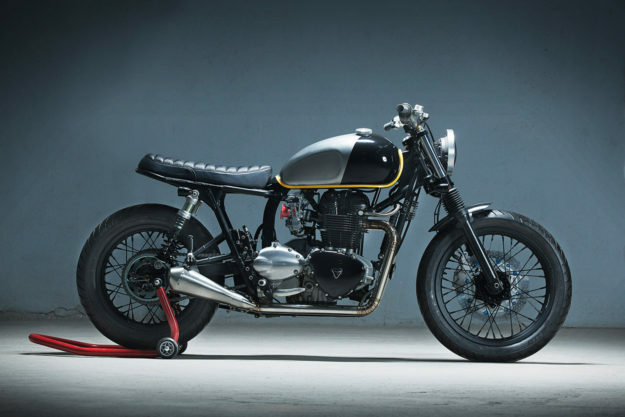 There’s hardly a Triumph Bonneville on the street that hasn’t been tweaked in some way. With hordes of aftermarket parts available for Hinkley twins, personalization is just a mouse click away. But it takes more than a fat wallet and an internet connection to build a truly show-stopping Bonnie. You need a keen eye and an abundance of skill—something that Kiddo Motors have in spades. 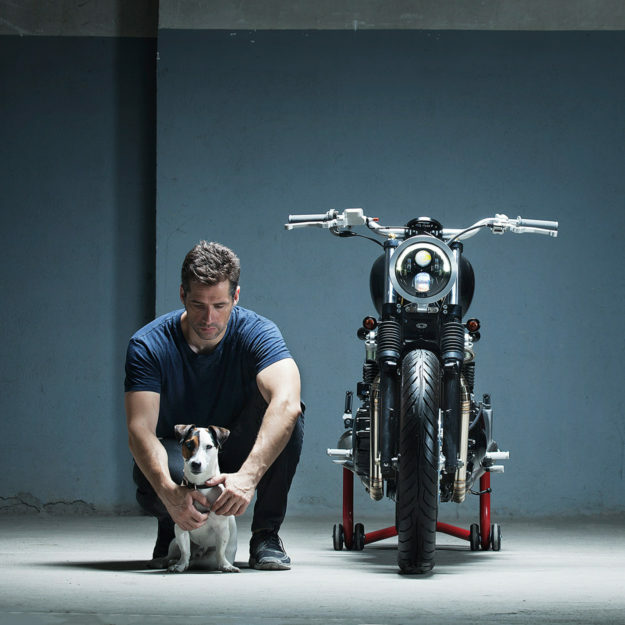 Based in Barcelona, Spain, Kiddo pride themselves on their minimalist approach—and building bikes that blend modern tech with classic aesthetics. 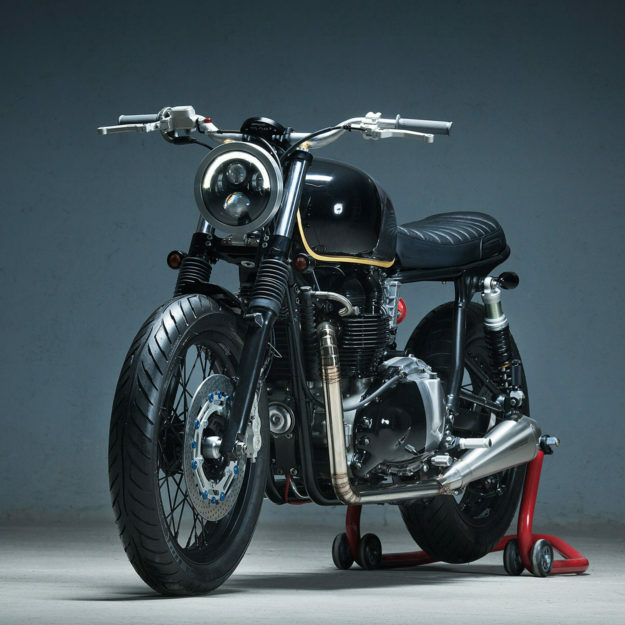 This 2004 Triumph Bonneville T100 is a prime example. It’s been named ‘Steve’s Bonnie’ after its owner, who sent it to the Spanish shop from his home in Scotland. With Christoffer Märtensson on fabrication duties, and Juanjo Jimenez handling the mechanical side, the project was underway. 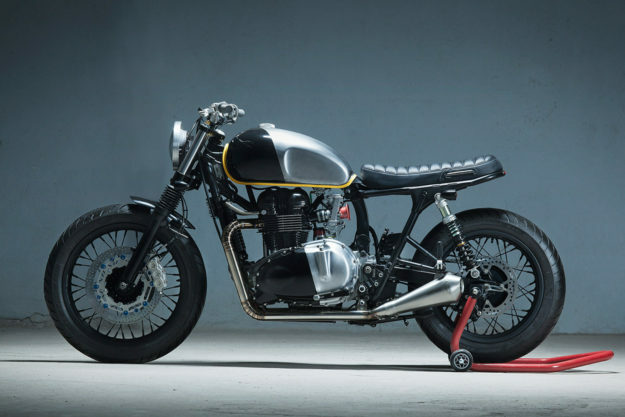 Now the T100 not only looks amazing, but also packs quite a punch. The stock carbs have given way to a pair of Keihin Flatslide CRs; they’re normally kitted with K&N filters, but for the photo shoot, they were swapped out for velocity stacks. The exhaust headers are custom made, capped off with mufflers from Spark. 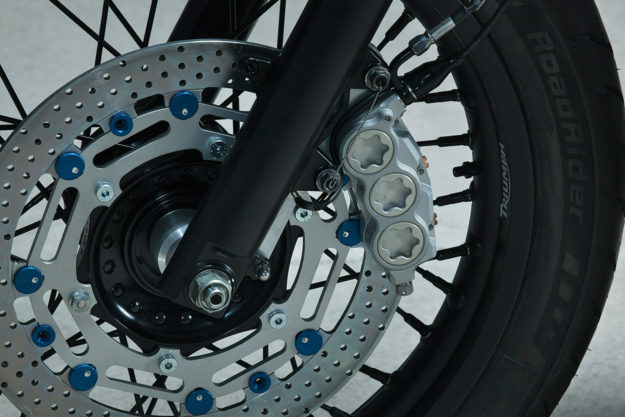 There’s also an ISR braking system up front, complete with a 6-piston caliper, oversized floating disc, and matching brake and clutch controls. The brake lines are from Goodridge, and the reservoir’s a Rizoma part. The handling’s been improved significantly too. The front forks have been upgraded with Andreani cartridge emulators, matched to a new set of Öhlins shocks out back. The wheels are tubeless, spoked numbers from Alpini Raggo, wrapped in grippy Avon RoadRiders. The cockpit’s impressive: a unique Easton EXP bar and riser combo sits on top of a new triple clamp from Free Spirits. (The bars have been re-done with a brushed finish). 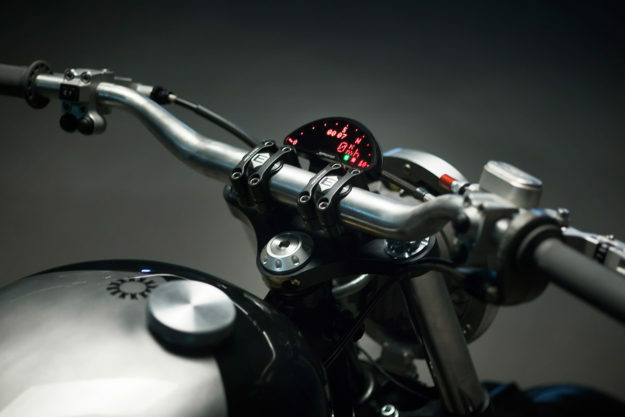 The grips are from Renthal, and the speedo, keyless ignition and switches are all from Motogadget. Take a look at how the switches are integrated with the ISR clamps—this build is littered with lovely little details. Kiddo have naturally re-wired the entire bike too. 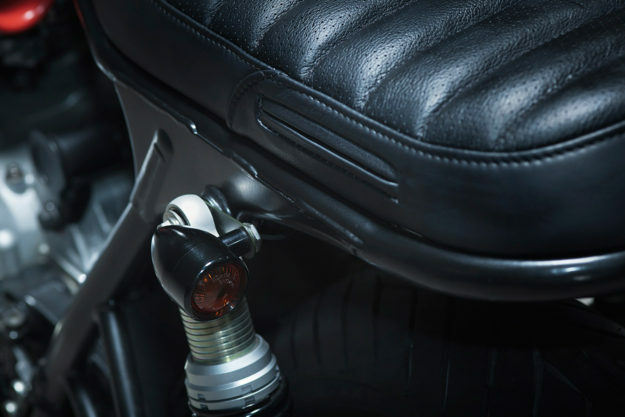 Everything’s running off a Motogadget m-Unit, tucked neatly into a stealthy under-seat electronics tray. 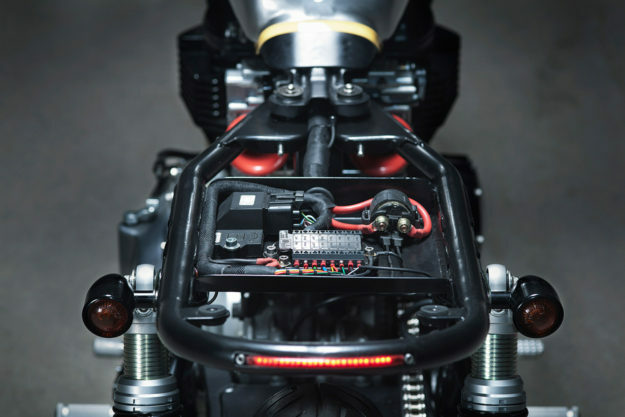 The battery’s been replaced by a Lithium-ion unit from Antigravity, hidden in a box below the swingarm. The Bonnie retains its stock tank, but the much-maligned seam has been cleverly transformed into a highlight with a vivid yellow pinstripe. And there’s a new leather seat—with a perforated section up top—that even includes a small wallet pocket. Underneath, the subframe’s been cut-n-shut, with a tidy LED taillight built into it. Finishing off the bodywork is a hand-made, ribbed front fender. 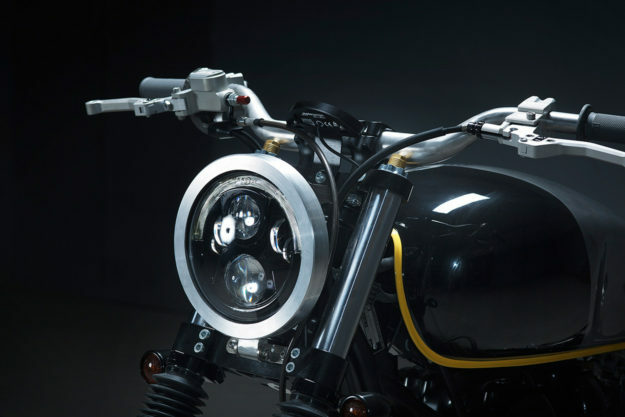 That interesting headlight is a super-bright LED model from Speaker. “It makes night riding insane!” says Sergio. Kiddo have treated it to a custom-made mount and bezel. 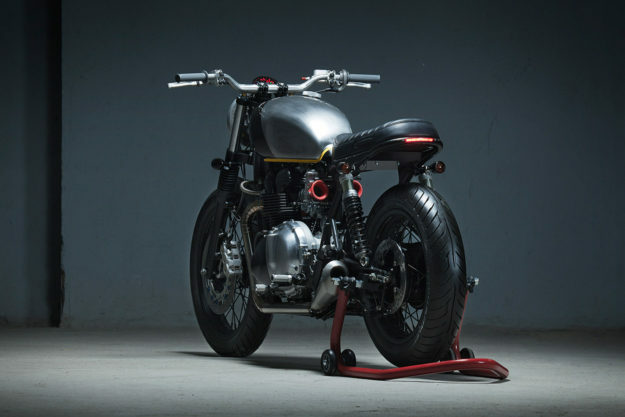 The turn signals are CNC-machine aluminum numbers from Motone, who also supplied the front fork mounts, gas cap, gear shifter and regulator relocation bracket. The foot pegs are from LSL. 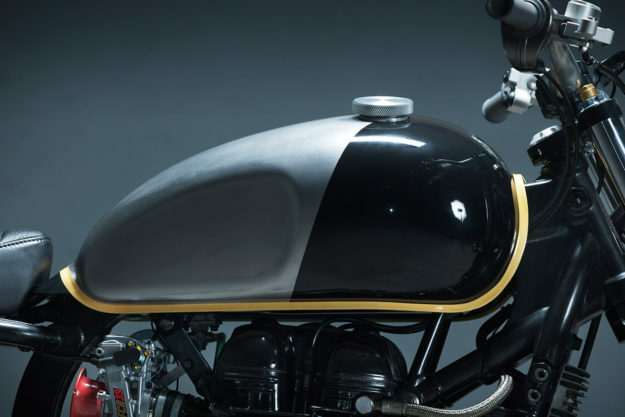 The paint job is so simple it’s sublime: black and raw, divided all the way down to the Triumph’s bulky clutch cover. That yellow accent, and a tiny Kiddo logo next to the gas cap, polish things off. Kiddo’s built another bike that has our jaws on the floor and our hearts racing. We wouldn’t change a thing—except the delivery address.